EPL 14-15 news: Arsenal injury news ahead of Hull City clash: Arsenal boss Arsene Wenger has given the latest injury updates on the following players ahead of Hull City game. Arsenal boss Arsene Wenger has given the latest injury updates on the following players ahead of Hull City game. Arsenal will face Hull City in Premier League on coming Monday at Emirates Stadium. The French boss has confirmed that French full-back Mathieu Debuchy is the major doubt for the coming game due to the hamstring injury he suffered in the training few days ago. 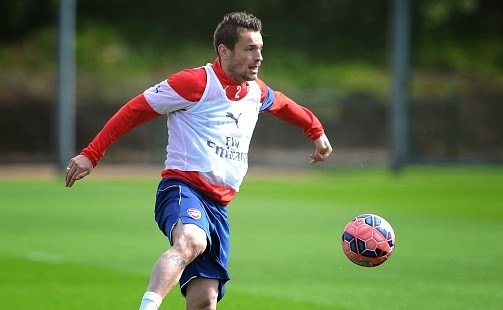 The 29-year-old full-back is not out for a long time he is expected to return after this game. Hector Bellerin is likely to continue to impress at the right-back role. While, the boss further confirmed that duo midfielders Alex Oxlade-Chamberlain and Abou Diaby have returned to training but are not match fit yet. They both are likely not to be rushed in the coming games. Both are expected to restart their first team game from next season. Mikel Arteta who is yet to return to first team action could be seen in the red jersey once again but not in this game. The Spanish midfielder returned from his ankle injury last month but he is still regaining his fitness for the first team action. Arsenal are on third spot at the moment having same points as of second spot side Manchester City. The North London side have a game in hand and could possibly take the second spot back. Manchester City will face Tottenham on the other hand.